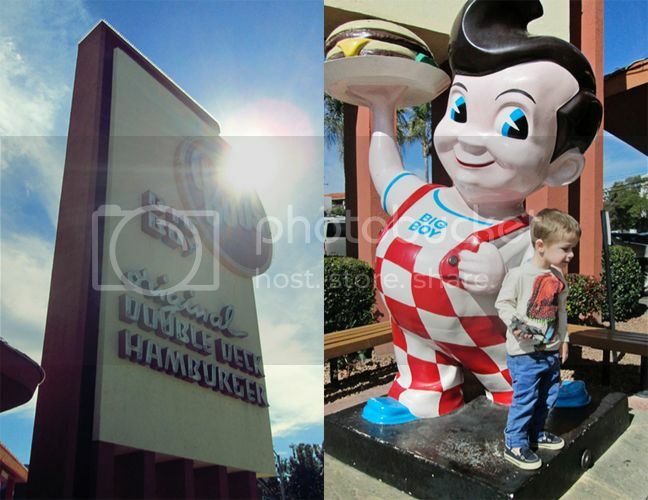 Chris has been wanting to go to Bob's Big Boy for a long time. He doesn't remember how he heard about it (perhaps when he was doing the search for historical LA landmarks that led him to Angels Flight?). 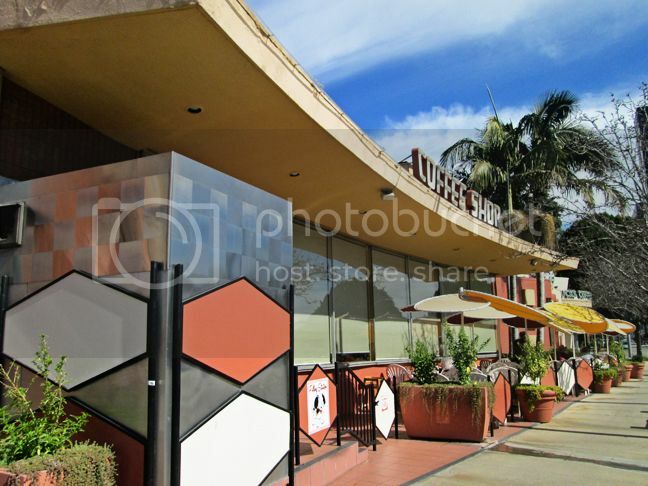 Nevertheless, continuing on with our Saturday of fun, after riding Angels Flight we drove up to Burbank to check it out. "In 1936, Bob Wian sold his prized DeSoto Roadster to purchase a small hamburger stand in Glendale, California. He named it Bob's Pantry. One night in 1937, a regular customer requested something different for a change. 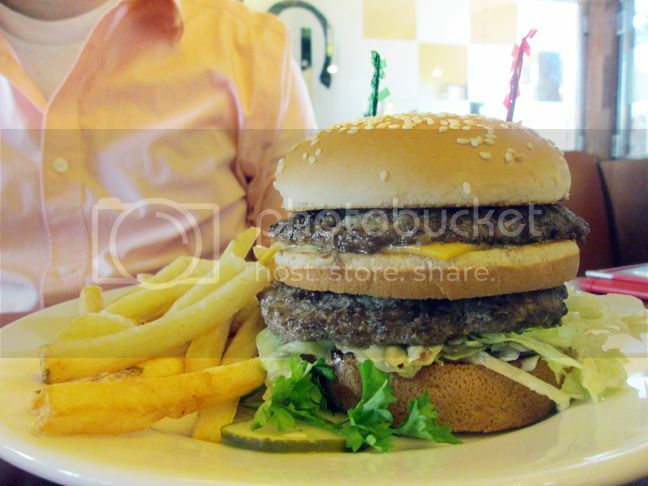 Bob went to work and the first double-decker hamburger was born. Customers couldn't get enough of Bob's new creation. One fan in particular was a chubby six-year-old boy in droopy overalls. 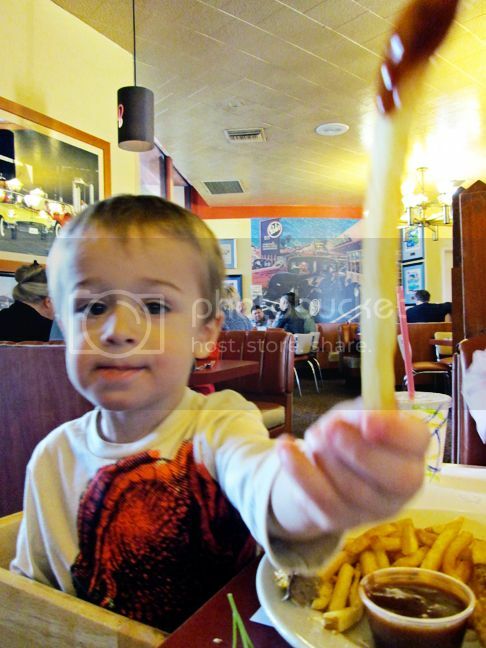 He would often help Bob sweep up in exchange for a free burger. In honor of his young friend, Bob decided to name the better burger the Big Boy. Another regular customer, a movie studio animator, sketched the now famous character on a napkin. The rest is history. 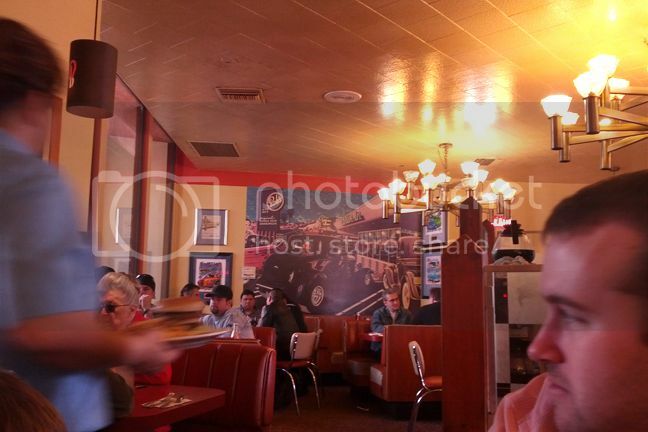 The Bob's Big Boy in Burbank is particularly special because it's the oldest remaining Bob's Big Boy in the United States. Over the years Bob’s has seen a parade of celebrity names stop by for a hamburger. Movie stars of old including Bob Hope and Mickey Rooney have been regulars. From the Beatles to the Beach Boys, the restaurant has served some of the worlds’ top musical talent. The Friday Night classic car show regularly brings in celebrities like Jay Leno." There you have it. What more reason do you need to try it out?! Of course we had to get a picture of Fox with the chubby Big Boy. 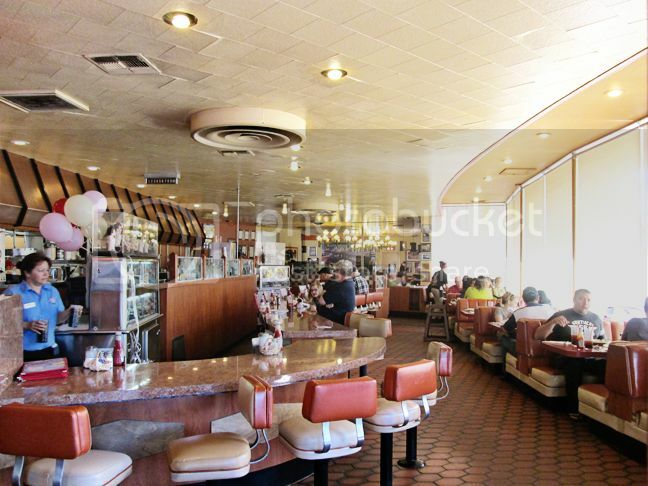 Such a classic, old, diner-style look and feel! They said the wait would be about 15 minutes so we hung out for a bit. But after only 5 minutes of waiting we were seated - sweet beans! Chris was eyeing this Big Boy like there's no tomorrow. We placed our orders and a few minutes later it arrived. It was yummy and I'm glad we went! 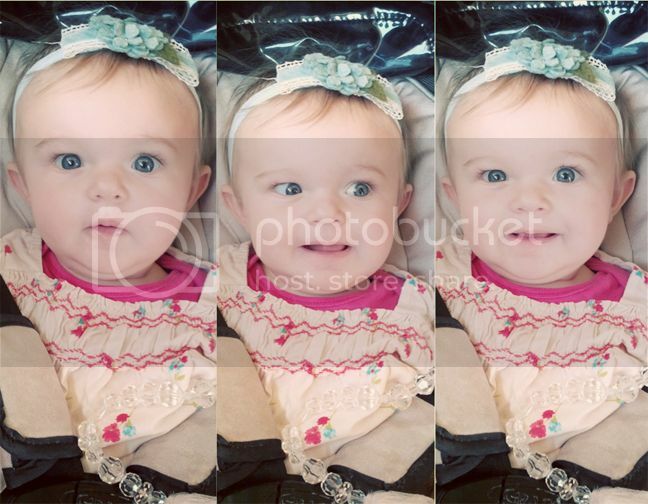 I only wish we had sat at the "Beatles Booth" (where the Beatles sat when they ate there). I wonder how long the wait is to sit there? Crossed another thing off our to-do list! 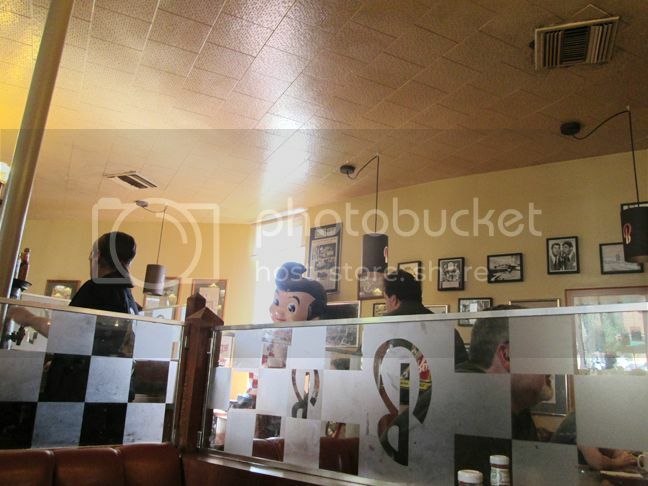 oh, i remember going to eat at big boy's in michigan every summer when i'd visit my grandparents...no idea what i ate there i just thought it was a cool looking place as a child. 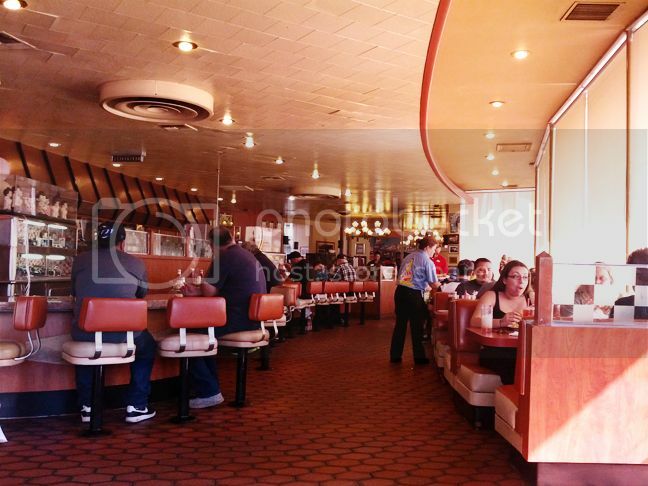 I remember going there also, when I was young they had one in my city, then it was torn down...so glad to hear there are still some left, that was some yummy looking burger!! So cool, I've always wanted to stop at the one in Baker! Never realized there was one so much closer to home! LOL - probably from Austin Powers. HAHAHAHA. Big Boy was a chain everywhere growing up, there was one on Baldwin where the Coco's is in Arcadia now (just down the street from the mall), and we used to go there after my piano lessons at Yamaha. I only remember the Big Boy outside and the spaghetti I only got when we went there (you know, cuz Chinese people don't eat spaghetti at home). I loved it!!!!! Yummmmmmmmmmmmm! I miss Big Boy's!! 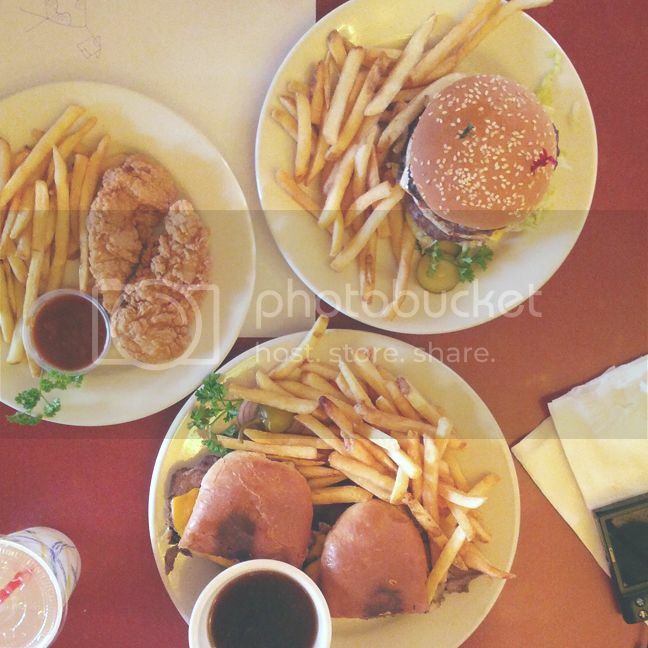 Oh gosh, I've seriously been craving french fries these past few days! If only I could chew anything right now!! Boo! oh how fun! love it...how cool would the Beatle's booth have been? I LOVE Bob's I used to go there when I was little--it was AWESOME!! 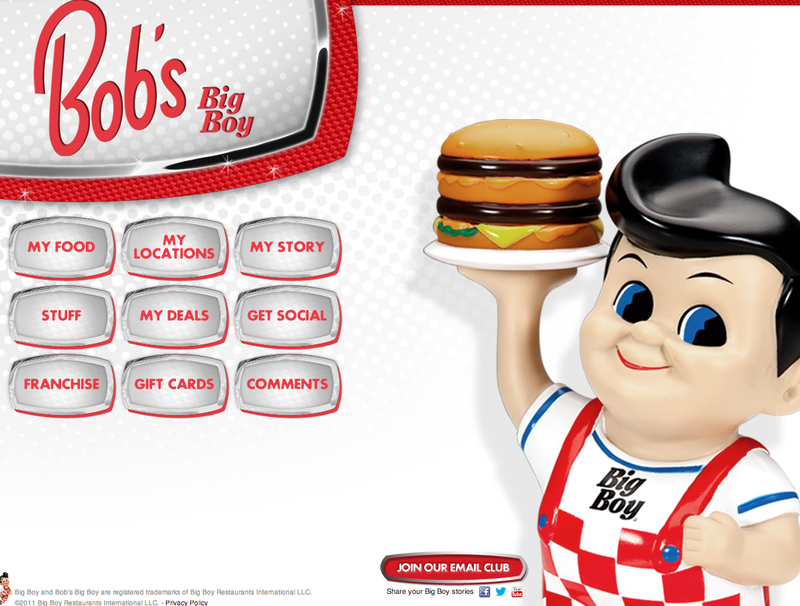 I remember eating a Bob's Big Boy when I lived in Orange Co. Loved it. Sadly there are not too many around anymore.